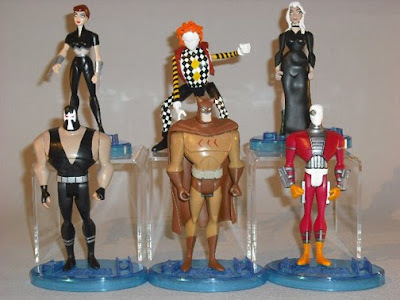 Forget the Sovereign Seven and the Fearsome Five, Marvel's Fantastic Four and DC's Secret Six is where it's at. Now sit back and take in a bit of news from the world of each, right here with The Usual Suspects. FANTASTIC FOUR: Ok, I'm just going to say it, I don't get why the Fantastic Four get left out of all Marvel's massive cosmic crossovers. Sure having the FF drop in may overshadow some of the guys, but with the Silver Surfer, Inhumans and Thanos already in the mix, it's bizarre that they're invisible to the story. Not that I'd want Jonathan Hickman's plans to be thrown outta whack. 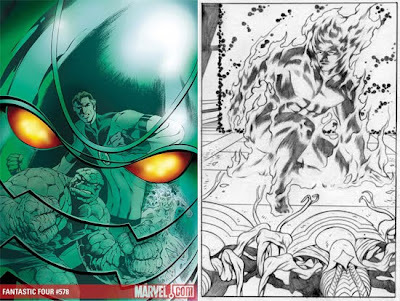 He's obviously building towards something massive, and the teaser for issue 578 that hit at Newsarama shows he's not only setting up the Annihilation creating Annihilus, things dont look good for the Human Torch either! Check the full preview after the jump. Nice! I love looking at custom toys. I am amazed how the artist reinvents and repaints each figure. So far my favorite is the Hellboy figure which was originally an action figure from Justice League. Thanks for the comment - glad you liked what you saw!